Most of the cast of the Tiwi Panto - Delara Williams, Kamahi King and Natasha Wanganeen (L to R) with all seven Pamanui. Photo by Angela Keith. It's taken a while to get all of its act together, but the world's first Tiwi Island pantomime is off and touring the country currently. 'Wulamanayuwi and the Seven Pamanui' – a Melville Island-mouthful version of Snow White and the Seven Dwarfs – comes complete with a fully Tiwi-designed set and suite of puppets by such well-known names as Raelene Kerinauia and Pedro Wonaemirri, and somewhat brief but colourful dive into Tiwi mythology including their Purrukupali foundation legend and the Kulama Yam ceremony. Did these myths really get into the heads of the packed sub-teen audience at Parramatta which clearly loved the wilder elements in this show (toured by Performing Lines) but hadn't, according to my immediate neighbours, even been prepared by their teachers to know where the Tiwi Islands actually were? It could have been a Maori show for all they knew! And that after a four and a half year preparation period which began with Tiwi expat, Jason De Santis being invited by Playwriting Australia to take part in a 3-day intensive workshop in mid-2009 to develop the script structure, themes, characters and style. Then a creative development was held in Darwin in 2010 which focused on the creation of a strong spoken language, experimentation with song and rhyme, and the incorporation of the Tiwi language. Initial concepts for the visual world through puppets and dance were also explored. The first public reading of the play was presented to the Milikapiti Community on Melville Island, Jason De Santis’ homeland. As the keepers of the Dreaming, it was culturally appropriate to hold the first public presentation for the Elders there. 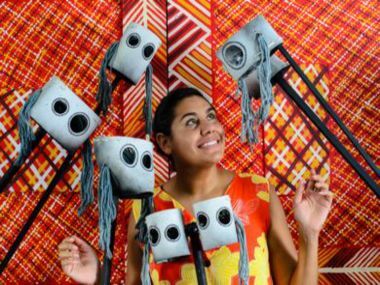 Following their approval, the set and puppets were created by artists from Milikapiti's Jilamara Arts Centre and original music was composed. 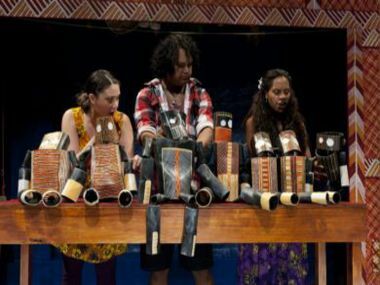 After two community showings, Wulamanayuwi and the Seven Pamanui premiered at Adelaide's COME OUT Festival in March 2011 and was remounted for the Darwin Festival in August 2011. Since then it has been presented at the Canberra Theatre Centre, the Castlemaine Festival and the Sydney Opera House. Jason De Santis also features as both narrator and Japarra, the Evil Spirit of the Water – a character capable of the camp melodrama worthy of the Tiwi Sistagirls who featured in Bindi Coles' breakthrough photo-essay. But he's only following orders from the even eviler Jirrikalala – a classic step-mother figure (though in the Tiwi tradition, she's a 3rd wife for our heroine, Wulumanayuwi's Dad) – played by Natasha Wanganeen, who's come a long way since her debut in the Rabbit Proof Fence film. Fortunately, all this evil is counter-balanced by a really good and magic white cockatoo – who may or may not be the spirit of Wulamanyuwi's dead Mum – who pops up whenever Jirrikalala's team think they've managed to wipe her out, and who wins the terminal battle at the end on board a scooter! En route, the Seven Brother/Dwarf puppets have been cruelly drowned and Wulamanyuwi has been blamed for their loss, and exiled from the only community she knows. Out in the boondocks, a little bit of Indigenous lore is offered as she makes the almost-fatal mistake of tucking into her totemic animal. And who should be on hand to save her but the man to whom she's been promised as a bride by her old-fashioned Dad; not an old fuddy-duddy as she'd feared but a cool, pop-song singing dude. It was intriguing how often I got Indigenous references that the kids missed; but then they clearly loved much of the crasser pantomimicry that I could have done with just a little less of. In other words, all those preparations and the imported direction of Belvoir Theatre's Eamon Flack have welded together a cross-cultural and tumultuously lively show for teens of all ages.